In the near future, nanofacturing techniques will allow incredible new materials to be built atom by atom. But they can only be built in the zero-gravity and high-vacuum conditions in space. Various private and government enterprises race to establish a buckytube mechanosynthesis factory on a suitable carbonaceous asteroid. To do so, they accumulate tanks of water in orbiting fuel depots, to be used as rocket propellant. Also needed are remote-controlled robonauts to do the grunt work. The key to success is water in LEO (low Earth orbit). At first, water will be expensively upported out of the deep gravity well of Earth. But for a third the fuel and energy, water can be supplied from Luna, the moons of Mars, or other nearby hydrated objects. Extracting resources at the work site is called In-Situ Resource Utilization (ISRU). Whoever develops ISRU technology able to glean water from space rather than Earth will gain the strategic high ground to make money through exoglobalization. When I first saw my gaming group playing this game, my first thought was this seems boring and overly complicated. Well, I was completely and utterly wrong. All you need to know is in the board, in you sheet and in your common sense. But I get ahead of myself, let me try to make justice to this game, i doubt i can, because this game is massive. You are beginning a space age, you have to gather resources do research and then use the valuable water you got to expand and create extraterrestrial factories. You want to basically exo-globalize the solar system. For that to happen you must gather water, the currency of the game and the fuel. Then you must proceed to do research for your rocket components, which are too delicate and heavy to be constructed on earth and then taken to low orbit ( solar sails are 7.5 km in length ), there you assemble your rocket and fly through space for glory!!! 😀 You are given a “character card” with a special power, that also represents your manned crew. You basically have 2 actions per turn ( a year in game time) that must be done in this order. You can move your rocket though space and do actions. The actions consist on getting resources (water), boosting the thing you want to build to low orbit, do research, claim a site, industrialize a site, build on a site. You also have a bunch of free actions, like refuelling the rocket, dump stuff in space, decommission material. The game ends when a pre-determinate number of factories is built (4 in a two player game, 6 in a 3 and so on). Being the first to get to a site and back with a crew gets 3 points;4 sites are available Mars, science sites, Mercury and any other site. One point for each claimed site. Each factory gives points taking into account the planet type saturation (8 points if only one factory of that type, 6 if two, and so on, to a minimum of 4). The points are limited, you can claim as much sites you want, but you have limited claim tokens, the same for the points, the factories and the first-to-reach are marked with the same tokens, so you have to think very carefully on your strategy. I realy cannot enter in more detail, it is HUGE, but at the same time, very simple. Because the game is a simulation, you only need to hear the rules once, because after that it just makes sense. So you want to exit that planet? Do your thrusters have enough acceleration to be able to simply leave or they have to burn a lot of fuel to get out of the planet gravity (other wise guess who is stranded). Want to do a quick turn into other planet orbit? you have to spend acceleration, because of the cost of getting out of movement. Its in a lagrange point where gravity is 0? you can do it for free. The game becomes natural. This game is not for everyone, although there is a strategic component, the simulation is what shines. The game can be long and tedious, but with the right socializing mind set, and if you do your calculations on other players turns it passes like a breeze. It`s the fealing of you building the components transporting them to orbit, calculate trajectories and fuel consumption to minimize travel time. At the end of the game I wasn`t concerned with the points. This game tells a story, how you and your organization managed in decades to conquer space. In decades I sent an unmmaned one-way trip rocket to Mars, claimed it for myself and extablished a factory. Meanwhile my rivals where exploring the asteroid belt. With my factory I then created the components needed to take my crew to the moon, eureka and back. While my rival was preparing to create the last factory on a small but valuable asteroid, I went on a suicide mission to Mars, and managed to not crash on the planet and establish the game last factory myself. It was awesome and epic. Im sorry for my messed up review, but this game is huge and so detailed that i cannot simply go over it. If you like the idea, don`t get scared of the game, play it once, and you`ll get the hang of it. 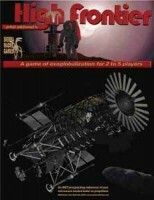 Add a Review for "High Frontier"